Information: modification of some emails sent by your forums. 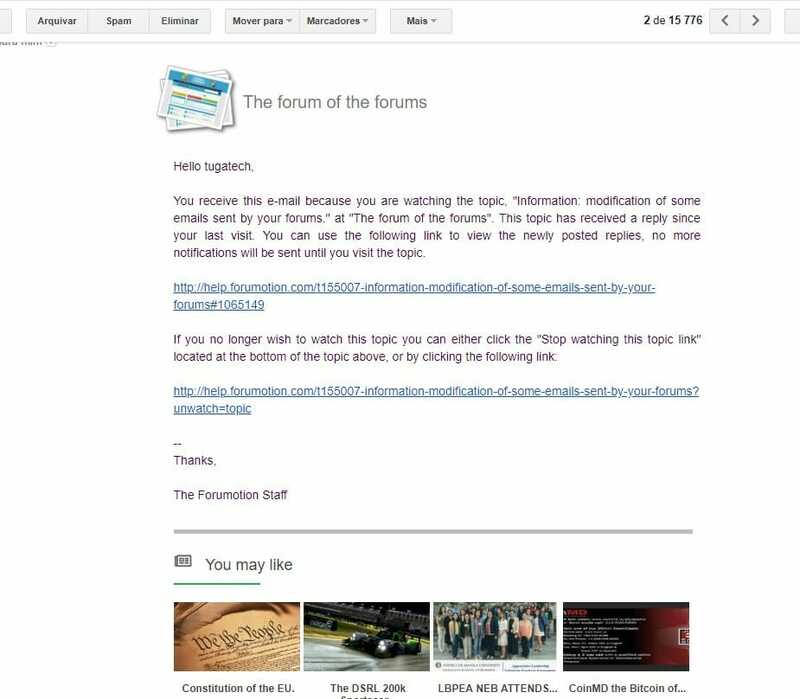 We would like to inform you that we will soon make a modification of some emails sent by Forumotion forums. 1. The latest Forum or Mag publications. 2. The last forum validated classified ads. 3. The next forum events. 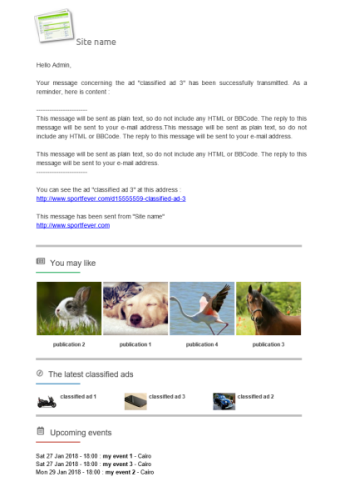 Re: Information: modification of some emails sent by your forums. And if we don't want that extra "advertise" to other websites in our own emails? Or we don't use publications/classified sections? Can we control that? The new design, however, looks great. You will only get it from the forums where you are a member. on your forum then you will not get any news. The "classified ads" and events indeed don't appear, but the latest Forum or Mag publications appear always for foruns that i don't have any relationship..
That is something completely different. It is similar topics. @SLGray wrote: That is something completely different. It is similar topics. You need to understand that traffic exchange is not what this topic is about. Im not talking about traffic exchange, im talking about the change that was introduced in this topic, about the emails. 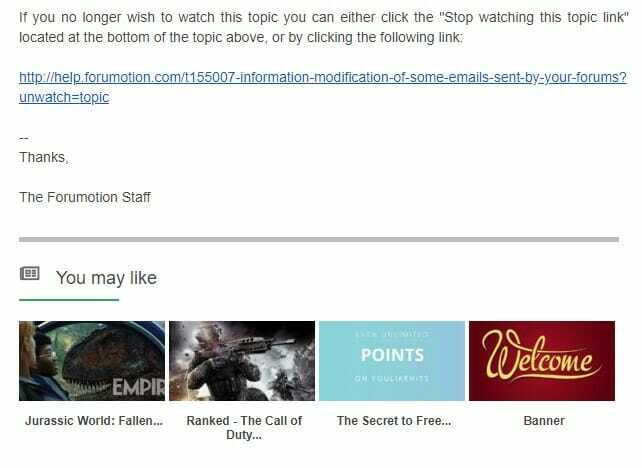 The previous image that i posted is from the email notification from this topic (check your email notification and you will see that section in the email). Think about it this way: free advertisement for your forums. @SLGray wrote: It has not been released yet. This topic is just to inform you that they are working on it. Yes I am receiving emails in the new format as well. I kinda like it tho. Nice modern look. Not a big fan of the "you may like" ads but its ok. Okay I see what your saying now. Yes the Notifications Email dose come up with random things from all forums @SLGray the news letter setting has nothing to do with this if you turn it off you still get them on this new system. That will help, i will test it out. I am not interested in the "you may like this" in the emails. I believe it's referring members to other sites. I have no idea who is advertising for me? I'm not sure I understand what you're saying in this post. Can you direct me where I would do this? I've never created a publication before. After you activate it, a link will appear in the navbar.